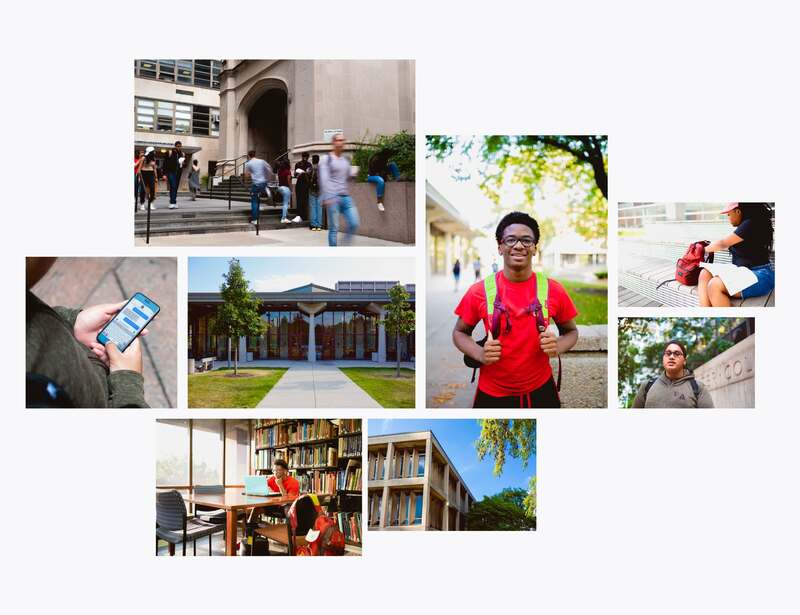 Moneythink started as an organization that tutored high school and college students on how to navigate college finances. 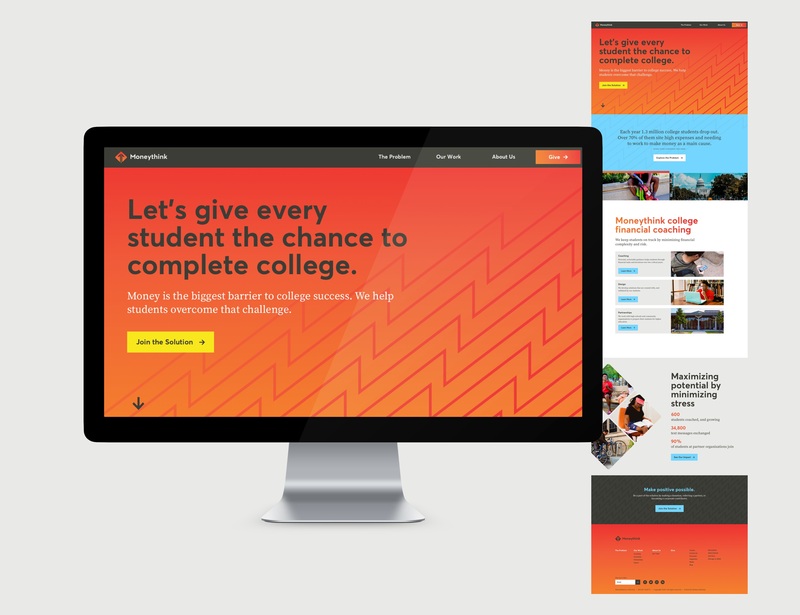 Since then, they have transitioned into a design-centric, problem solving organization with the goal of making a 4-year degree accessible to every student. 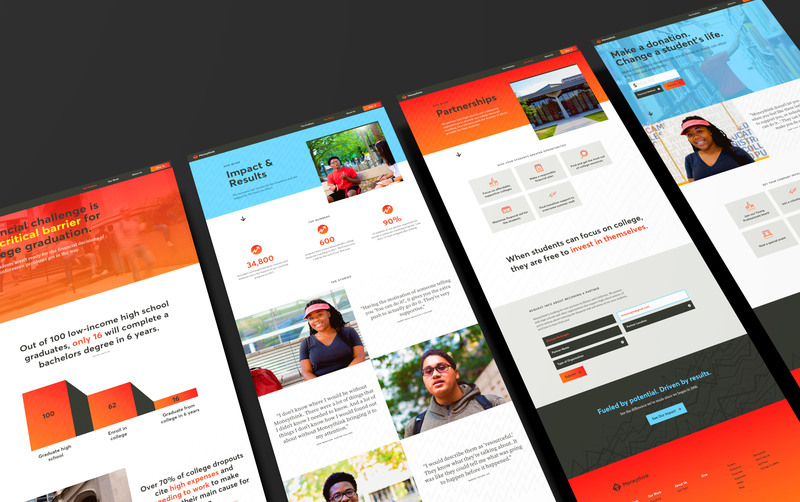 When Moneythink approached us, the ask was to update their brand to reflect their organization's transformation, then build out a website that accurately told their story and guided their various types of users to the right destination. Upon our Brand Discovery session, we learned two major things—first, that they struggled when it came to conveying their complex mission, and second, that they had two very different types of users that we needed to accommodate on the website. Just as Moneythink aims to transform students and a broken education system, the logo we designed transforms the letter ‘M’ to create an upward arrow. The new brand depicts positive growth for a demographic that is in desperate need of it. The rest of the visual identity builds on that theme—a bright and positive color palette, a pattern of upward moving spikes, and photography that shows confidence and empowerment. The new Moneythink website addresses the key findings from our initial engagement with their team. The home page tells their story in a concise, logical way. From top to bottom, we answered: What they do, Why they do it, How they do it, Why you should trust them & What you can do to help them. With a simple site structure, we considered both of their two main user groups where we want them to go and to perform the action we want them to complete. We considered both types of their main users—donors and partners—when we constructed a simple, guided site structure that would help either user perform the action for which they came at the site.